Our Hope Sustainers are a special group of passionate supporters who believe in our mission and commit to give a reliable monthly donation to FMSC. 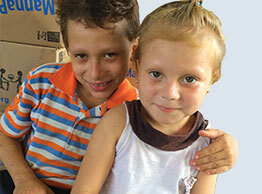 Your monthly gift lays the foundation FMSC relies on to send meals to kids like David and Seiling. Thank you for giving food to me and my sister! We always pray for you. God bless you! "I like knowing how my gift multiplies to feed so many people." "Knowing that even when I don't have time to volunteer and pack, I am still helping." "I like knowing that each month the meals are making a huge difference in people's lives and I get to be a part of that." NOTE: When you choose to give monthly via EFT (electronic bank transfer), you will save FMSC 2.5% on transaction fees and MORE KIDS WILL BE FED! Not able to donate monthly by bank account? For more information or updates to your monthly contribution, please contact Katie Olson at kolson@fmsc.org or 763-951-7455. "...To them I was like one who lifts a little child to the cheek, and I bent down to feed them."